Recommended Grain: Wheat berries, faro or other more delicate grain. This whole grain salad is hearty enough to be served as a side dish at a potluck or as the main dish at dinner, yet is sweet enough to easily be enjoyed at breakfast. Take advantage of this recipe when berries are on sale at the grocery. Choose any combination your favorite disease fighting berries and reap the benefits of their nutrient dense compositions. Some examples include raspberries, blueberries, strawberries and black berries, although any fruit would fit into this dish if desired. This recipe is written for 2 serving. Make adjustments as needed and remember to cook in large batches to have healthy leftovers on hand. If you are unfamiliar with whole grains visit the Whole Grain Description page under the Farmacy tab at the top. Directions: Cook the whole grain according to the instructions. Squeeze the juice of 2 oranges in to the small sauce pan. Heat on medium and reduce to half the fluid volume. Pour the concentrated juice, orange zest, honey, cinnamon and 2 small mint leaves in the blender. Puree until a homogeneous mixture is reached. 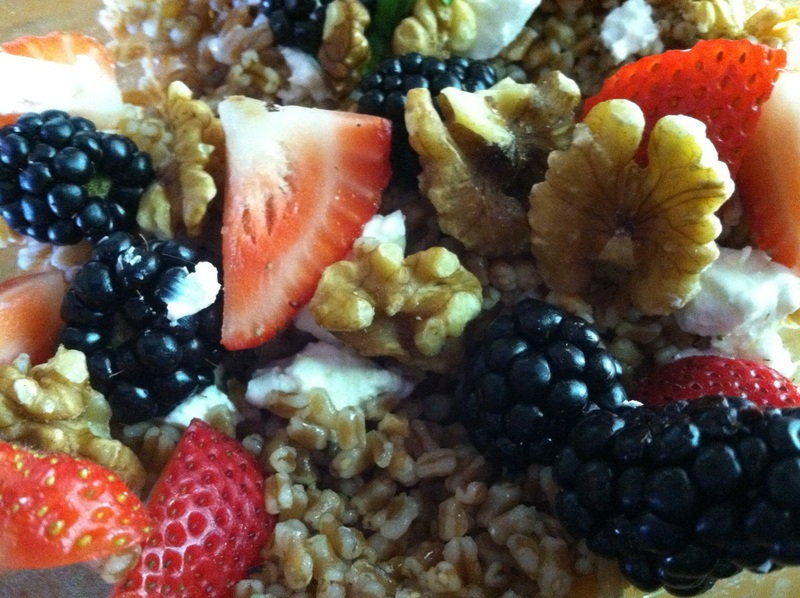 In a mixing bowl combined the cooked whole grain, the orange dressing, goat cheese and fresh berries together. Top with fresh berries, nuts and chopped mint.